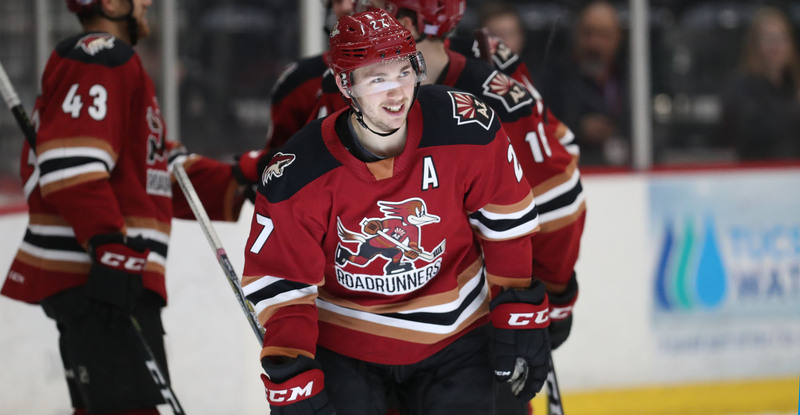 Boosted by early production to build a strong first period lead and backed by Adin Hill’s second-straight shutout, the Roadrunners topped the Texas Stars by a 4-0 score Wednesday night at Tucson Arena. Hill, re-assigned to Tucson from the Arizona Coyotes last Monday, has now posted shutouts in each of the two games he’s started since returning to the Roadrunners, and has gone 123:26 without allowing a goal. The 22-year-old netminder’s 39 saves is a new season high, and the most he’s ever registered in his career when holding an opposing team scoreless. 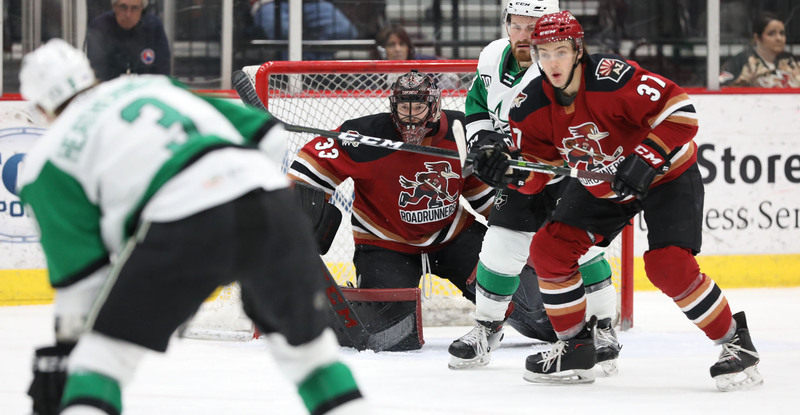 Three goals in a 5:47 span in the first period gave the Roadrunners a solid 3-0 lead to work with, and despite Texas’ comeback efforts, they stood strong to secure their third-straight win. Dineen would open the scoring, netting his third goal of the season just over five minutes into the contest when his pass attempt into traffic ricochet off of a Stars defender and into an open net. Less than four minutes later, Michael Bunting deposited a shot low to the blocker-side after Lane Pederson disrupted a Texas clearing attempt, giving the Roadrunners a 2-0 advantage. Bunting’s tally extended his goal-scoring streak to four games. Just over a minute later, Brayden Burke would up the Roadrunners’ lead to 3-0 when he found the back of the net on a fast-break sequence after receiving a lengthy stretch pass from David Ullstrom. Neither team would score in the second period; Hudson Fasching’s goal with :14.5 seconds left in regulation all but iced the game, giving the Roadrunners a 4-0 lead, the night’s eventual final score. The Roadrunners will open up a two-game weekend series against the Bakersfield Condors Friday night at Tucson Arena, where the puck is scheduled to drop just after 7:05 PM.